Dubai: Black Cube Solutions’ founder sure has set his sights high — redefine skills development and career progression with more than a little help from artificial intelligence and machine learning. Peer Mohaideen Sait, CEO of the startup, said organisations are unable to identify which skillset is required for a particular role and that remains the most pressing challenge. Training Calendar, an e-learning platform, was started as a B2C product in 2017 but now offers services such as e-learning and includes a tool to measure performance management. Sait said that while e-learning platforms have made it more accessible for a wider audience, it has become easier to monitor their progress and identify courses suitable to their career progression. And this will help not just the individuals. We are getting good responses and queries globally. We have invested $1.7 million and plan to expand aggressively across the globe. The Training Calendar is free for individuals but companies need to pay to get their staff trained. He said that an individual needs to upload their own skillset and depending on the data, the AI platform recommends courses [online and live video courses] based on the tile he/she is having. At the same time, he said that companies can train their own staff, based on their skills, and assess their performance and also hunt for new heads by analysing detailed profiles and shortlist the best-suited profiles. “Professionals can understand what skills they need to further excel in their current role and helps them to take the initiative and build their skills,” he said. Training Calendar is available on Google Play Store as free for individuals and will soon be available in Apple’s iOS but Innowork is a paid platform for corporates and is available on Google and Apple play stores. “We try to capture the skill anthology for every designation and to assess the performance of an individual, we have launched Innowork. Now corporates are pushing its workforce to learn new skills or upgrade their skills,” he said. It offers about 100,000 courses that have been aggregated from different e-learning platforms such as EdX, Udemy, Coursera, Alison and from leading business schools. Out of 100,000 courses, 80,000 courses are e-learning and about 20,000 classroom courses. “By talking to people and companies, we get to know the pain areas and have incorporated those features into our system,” he said. 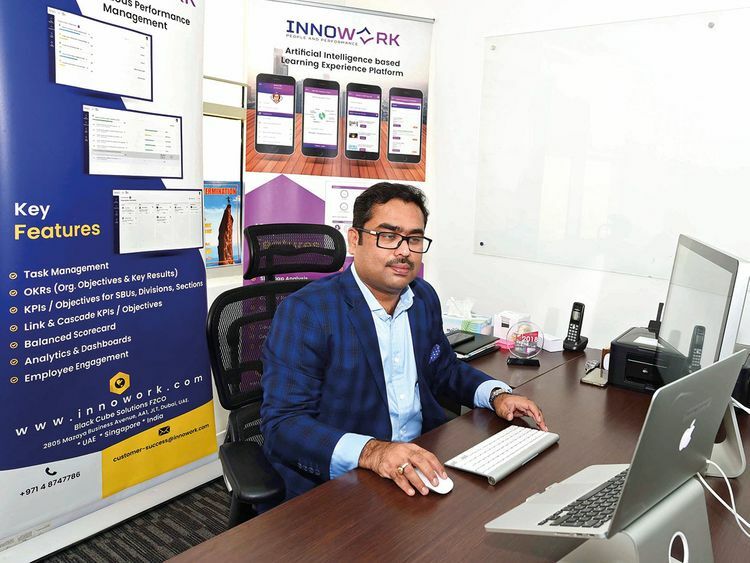 Seven companies with 5,000 employees in the UAE are using the Innowork and 16,000 individuals from around the world are using the Training Calendar. The development team is in India and the platform is going to be launched in India soon. The portal, currently, supports English and Arabic, but more than 20 languages are going to be added to the platform this year. “We are getting good responses and queries globally. We have invested $1.7 million (Dh6.24 million) and plan to raise $3 million as Serie-A fund to expand aggressively across the globe (also keep the main office in the US) and invest in sales and tech team (particularly more on Business development team, Support team, data scientists and increase AI capabilities) to increase sales and provide high quality customer support. “We are also looking for partners in each country to push the product across the globe. As we capture a lot of data, we are looking for more data scientists to crunch the data and make it useful for us,” he said. Peer Mohaideen Sait, a former management consultant, has over 20 years of experience in the field. He worked eight years as a strategy and process adviser to Abu Dhabi Municipality and was involved in two business process re-engineering projects during his tenure. He holds an MBA from HULT International Business School. He has provided consulting services in strategy, performance management, talent management, process development for more than 100 companies globally and is also a certified innovation master, certified management consultant, certified balanced scorecard professional, certified process professional and certified Lean Six Sigma Master Black Belt. He has also worked as a guest lecturer of innovation, entrepreneurship and strategy in leading business schools in India and UAE.